-Douglas-fir beetle (Dendroctonus pseudotsugae), another close relative of the spruce beetle and mountain pine beetle, is an important native bark beetle of mature Douglas-fir (Pseudotsuga menziesii) forests across most of the West. Outbreaks tend to be associated with mature Douglas-fir forests (average stand diameters greater than 14 inches at 4.5 feet from the forest floor) coupled with periods of below-normal precipitation. Adults typically seek new trees to attack from late spring through early fall. Unlike other bark beetles in Colorado, Douglas fir beetles can use trees that have fallen or been cut and left for removal at a later date. The most apparent indicators of Douglas-fir beetle infestation are small groups of dead and dying Douglas-fir trees. Infested trees have their needles fade from green to red-brown (rust colored) before starting to drop off. Fading foliage occurs about one year after trees have been attacked, typically after adult beetles have emerged and left for another green tree. Other symptoms of Douglas-fir beetle infestation may include the presence of reddish-brown boring dust around the base of trees and within the cracks and crevices of the bark. Woodpecker damage, where the birds have stripped portions of the bark from infested trees in search of larvae (leaving accumulations of bark at the base of trees) is often an indicator of bark beetle presence. 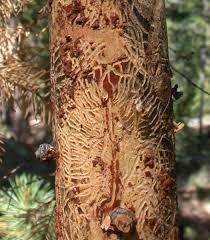 Exit holes on the bark surface may be seen after the adult beetles emerge from infested trees. Pocket activity occurred in portions of the Flat Tops Wilderness, Rampart Range and Sangre de Cristo Range. Most of the Douglas-fir forests surrounding the communities of Gunnison, Salida, Aspen, Ouray, Telluride and Eagle were heavily impacted. 14,000 acres of forests comprising Douglas-fir were impacted in 2017, compared with 19,000 acres in 2016. 11,000 new, previously uninfested acres of Douglas-fir were impacted statewide, also a decrease compared to 2016.